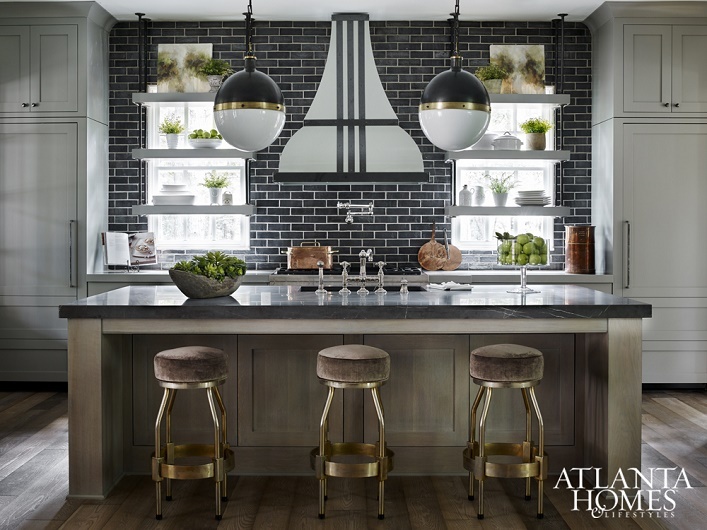 A collaboration between Atlanta top design firms Michael Morris, director of interior design at Monte Hewett Homes and designer Melissa Nagle of Bell Kitchen & Bath Studios, this timeless kitchen with a glamorous twist is surely a head turner! The beautiful charcoal-colored backsplash, charming custom hood and those gorgeous brass bar stools make my heart go pitter-patter. I am also drawn to the lovely monochromatic color palette and the delightful suspended open shelving! Such a well-designed and stunning space, what's not to be inspired by? Your thoughts? Love everything especially those stools and tile!